Modern has kept me busy lately. Fatal Push generated a metric ton of buzz, Dredge and Infect terrorized Modern and were subsequently nerfed, and most recently, I’ve had my heart set on building entire decks around the improvise mechanic or Smuggler’s Copter. All these developments have prevented me from writing about how Aether Revolt‘s less obvious cards have worked their way into my brews. Today, we right that wrong by looking at three brews I’ve been sleeving up that use some newer cards to great effect. Perhaps the splashiest mythic in the set, Heart of Kiran caught the eye of many looking for the most pushed vehicle during Aether spoilers. It was overshadowed in Standard by Smuggler’s Copter until Copter’s recent removal from the format, but Heart has one major upside in Modern: its whopping four points of toughness. I still believe Copter to by and large be a better two-cost vehicle, so my solution for building a deck with Heart was to simply play both. I think Heart of Kiran‘s regular crew condition is too pricey. Modern is a fast format, meaning we’d usually rather just attack with our three-power guy if we can. There are also more reliable beefy creatures at two mana if we’re in a deck that has aggressively costed three-power guys at all, namely Tarmogoyf, Grim Flayer, and Tasigur. Heart’s vigilance dimension grooms it for a shell wanting to clock while playing defense, which made me consider aggro-control decks on the midrange end of the spectrum. Planeswalkers slot nicely into this kind of deck. The most efficient/playable ones available are Liliana of the Veil, a contender for the most impactful fair card in Modern, and Jace, Vryn’s Prodigy, who synergizes nicely with other elements we want to play. Lingering Souls loves being looted, and Copter plus Jace gives us plenty of ways to throw it away. Jace’s legend status also makes him a prime target for dumping. The flip-walker can re-cast spells we’ve discarded to Copter or to his own effect, and it enters the battlefield with a ton of loyalty, making it simple to support Heart of Kiran. Esper Vehicles exerts a weird tension on opponents when it comes to spot removal. On the one hand, Jace and Copter are prime targets for Lightning Bolt and Fatal Push. On the other, hitting one and seeing it chased with another can prove extremely frustrating. We never really want Jace or Copter in multiples, and if they stay on the table, we get to generate a snowball of advantage while looting away our extra copies. If they die, we can simply play out one of those extra copies. Creeping Tar Pit also punishes opponents for throwing away too much spot removal early. Lingering Souls gives the deck an angle of attack that practically invalidates spot removal. Running the full set alongside card selection tools like Jace, Copter, and Visions allows us to amass a fleet of Spirits at a moment’s notice in the mid-game, a plan that buys us time and diverts enemy removal spells from our superior targets while applying pressure that will have to be dealt with eventually. The combination of Snapcaster Mage, Path to Exile, and Fatal Push gives this and other Esper decks a great chance of staying alive into the mid-game, when its cards shine brightest. Given my love for tribal spells and cantrips, Rogues has been a pet deck of mine for some time. After all, they get what can sometimes be the best cantrip in Modern—and it grows Goyf, to boot! I’ve built many decks featuring Tarmogoyf and Thieves’ Fortune, and all across the color spectrum (although especially in Temur). But Sultai only became genuinely intriguing recently, with the release of Fatal Push. Rogues’ most limiting factor has always been its slim roster of potential threats. Push aside, it’s Aether Revolt‘s Fourth Bridge Prowler that pushed me to pay the wedge another visit. Goyf and Serum Visions are constants in all my Rogue decks; Goyf is the reason I build them, and Serum helps me achieve what I want to achieve each game. I’ve also preserved the Traverse the Ulvenwald package from my last foray into brewing with Rogues. The whole point of the deck is to enable a card that simplifies hitting delirium, so I don’t see turning back anytime soon in regards to this decision. Faerie Miscreant also sticks around. Miscreant enables Spellstutter Sprite, which incidentally is pretty good with the already on-theme Mutavault and gets even better with Faerie Imposter. Traditionally, my brand of Rogues was basically shoehorned into Temur colors for Lightning Bolt. This kind of micro-synergy-based tempo deck needs a way to cheaply remove creatures in the early game. Fatal Push gives us another option, and its release coincides nicely with that of Fourth Bridge Prowler. Prowler has been awesome for me. It has all the potential upside of a well-timed Peppersmoke as well as offering plenty of adorable synergies. Instead of drawing a mystery card and growing Goyf, Prowler loosens the conditional requirements (it doesn’t require a Faerie in play) and gives us an on-tribe body. Best-case scenario, Prowler comes down early to kill off Dark Confidant or Noble Hierarch before getting in some hits to turn on Thieves’ Fortune. The creature has plenty of juicy late-game targets in Modern, too, ranging from Snapcaster Mage to Vendilion Clique to a lowly Spirit token. Don’t judge; value is value! The wealth of cheap 187 abilities we accrue between Prowler, Miscreant, Snapcaster, and Spellstutter incentivize us to run some amount of Faerie Imposter. Imposter’s drawback of forcing us to re-cast a creature is greatly mitigated when that drawback nets us a card or a removal spell in the process. I started with just one Imposter as a Traverse target and ended up adding a second to increase the odds of drawing her naturally. Running so many one-drop Rogues lets us max out on Thieves’ Fortune, which becomes significantly more reliable. As a result, we can safely include one-of bullets like Abrupt Decay and Murderous Cut for tricky situations, as well as expect to see matchup-specific threats every game after siding. For the first time, I’ve included Cloak and Dagger in my Rogues list. I’ve messed around with this card in the past, but it always did too little to make it to the main. With ten powerful one-drop rogues (over half of which fly), and added incentive to run the creature-bouncing Faerie Imposter, Cloak becomes much more appealing. A 3/1 with hexproof is surprisingly tough for many interactive decks to deal with. If that 3/1 also has flying, it becomes a nightmare. Cloak also functions fine in the graveyard; losing the equipment to a discard spell or Abrupt Decay usually turns on delirium right away, a feature we can leverage favorably with Collective Brutality. Despite my blowout RPTQ performance last December, I maintain a lot of love for Counter-Cat. The deck is a blast to play and surprisingly resilient in metagames not brimming with Chalice of the Void and Conflagrate. It’s rare that my goodstuff decks benefit significantly from new expansions, since I tend to favor tempo strategies full of too-good commons over midrange ones packing obviously pushed mythics. The revolt mechanic excited me on this front when it was revealed. Aether Revolt didn’t disappoint, bringing Counter-Cat an exciting tool to combat the midrange strategies it struggled to beat before: Renegade Rallier. Generally, Modern cards that provide card advantage cost a lot of mana. Esper Charm, the format’s most recent card advantage staple, costs three mana. So does Painful Truths, a card Jund and Grixis Delver have been known to sideboard for grindy mirrors. 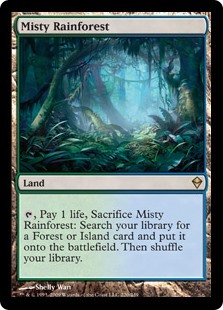 Mana can be loosely translated to tempo, since players get to play a single land each turn and must spend their limited resources wisely in a format as fast as Modern. Ancestral Vision, the apparent exception to the cards-cost-mana rule, still costs pilots plenty of tempo, as it refuses to resolves until the fourth turn after it’s been suspended. Similarly, tempo-positive spells in Modern usually come with card disadvantage. Simian Spirit Guide and Desperate Ritual are classic examples of spells that temporarily put players up a turn in mana development, but cost them a card, essentially putting them down a turn in card economy. Collective Brutality embodies this principle very clearly, doing way more than a spell should for just two mana, but requiring discards to escalate. Enter Renegade Rallier, a creature that promises both card advantage and tempo. Three mana can seem like a lot in a deck that slings 3/3s for only one, but it’s nothing compared with Snapcaster Mage, the most obvious analog to Rallier in Modern. Snapcaster is one of the few cards in Modern that provides card advantage and tempo, advancing the board with a 2/1 for a tack-on price of 1U while netting players a used spell for its mana cost. 1U, too, is too much to pay for a vanilla 2/1 in Modern. But with the added benefit of card advantage, it becomes acceptable. Rallier ups the ante. 1GW for a 3/2 is arguably a worse rate than 1U for a 2/1, although marginally so. Kird Ape‘s laughable status as a clock compared with Nacatl and Delver attest to the difference between two and three power. Rallier’s two toughness also happens to be in the sweet spot for Mutagenic Growth to save him from Lightning Bolt. Regardless, whatever mana is lost paying for his body, Rallier makes up for with his ability, which doesn’t require us to pay mana for the dead creature we target. Consider giving a one-mana spell flashback with Snapcaster Mage. 1UR for a 2/1 and a Lightning Bolt is a great rate, in part because Bolt itself has such an aggressive rate. Incidentally, Counter-Cat’s creatures also possess such rates. In many matchups, I think 1GW for a 3/2 and a 3/3 is significantly better than the same amount of mana for just one body. If we’re recurring Tarmogoyf and not Wild Nacatl, the tempo we gain becomes even more significant—in that scenario, we’re basically casting Goyf (1G) and Nacatl (W) and going up a card for free. In late-game situations where mana abounds, Rallier can even recur Snapcaster Mage and put us up more cards—one spell for two bodies and a Path to Exile might as well be Painful Truths without the life loss. In terms of reliability, I have found Rallier to function well at two copies. Counter-Cat runs 12 fetchlands, which account for two-thirds of the skimpy manabase. Rallier performs best in the late-game, by which time some of those fetches can become dead as we fetch out our lands. The creature does a fine job turning them back on to some degree. As mentioned, Rallier’s primary function in the Counter-Cat sideboard is to shore up attrition matchups. The deck can struggle against Grixis openers featuring Bolt, Push, and Terminate; sometimes, those draws just kill all our threats and make it hard to bounce back before opponents manage to stabilize. No more! Opponents answering us one-for-one are bound to start doubting their ways when Rallier comes down and invalidates their most recent play, all while adding to the board himself. The creature also has a “hidden mode” (man, do I love scare-quoting that phrase) of ramping us by one, which can prove relevant against linear decks or in mana-light situations. Sometimes, putting some pressure on the board without going down a card is exactly what the doctor ordered. Cracking a fetch on turn three, resolving Rallier, and recurring that fetch is the Selesyna warrior’s version of Probe-Snap-Probe, and it’s great with Huntmaster of the Fells, Isochron Scepter, Snapcaster Mage, or a bunch of two-mana spells in hand. Another aspect I like about Rallier is how it gives Counter-Cat even more options. Gaining access to another midrange hoser under four mana lets us cut Isochron Scepter down to one copy, which makes the artifact more of a gotcha! card and less of a fragile package. Opponents must also sequence their removal differently to play around Rallier, so as not to trigger revolt on our turn. Forcing opponents to sequence disruption in awkward ways is exactly what Counter-Cat wants to do, since it allows us to dictate the pace of the game and maximize blowouts with our conditional coutermagic. Rather than rebuild Counter-Cat from the ground up like I did with Temur Delver after the Probe ban, I stuck with the heavy core and looked for replacements. Unfortunately, Counter-Cat really wants six one-(or less)-mana sorceries to help remove Tarmogoyf from Bolt range. I tried a few cards in the deck over Gitaxian Probe, including the revolt-enabling Mishra’s Bauble. Traverse was too unreliable with the focus on Hooting Mandrills; Thought Scour didn’t bin the right card types often enough; Bauble was too awkward with Delver in a deck already dangerously low on instants and sorceries. 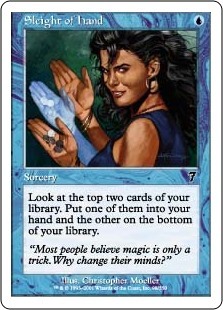 I settled on Sleight of Hand, the strongest generic blue cantrip in Modern after Serum Visions. So far, I haven’t been too unimpressed. Sleight is better than Probe in situations where we have mana to spare, but worse when we’re light on lands. The cantrip is especially bad when we draw multiple nonblue lands naturally (i.e. Temple Garden and Forest) and have to ration out the mana from a lone Steam Vents on Bolts, Visions, Sleights, and permission spells. One benefit of Sleight is it allows us to keep a wider range of hands, since its selection effect gets us two cards deeper to a second land drop. One-landers with Probe and no Visions were almost always mulligans. The jury’s still out, but I’m sticking with the Sleights for now. One of Wizards’ primary goals for Modern is that Standard cards and decks can transition into the format after set rotations. So far, they’ve done an admirable job—despite cards like Urza’s Tower, Tarmogoyf, and Blood Moon running around, it seems Modern gets some new toys with every expansion. The format’s deep card pool rewards players for pairing new arrivals with old sleepers. For some, that means dusting off old launch promos of Breaking // Entering; for me, it means tracking down a set of Cloak and Dagger. If Aether Revolt has inspired any brews of your own, share them in the comments. And if not, I’d wager it’s only a matter of time until Wizards prints something that stirs your inner Johnny. Just FYI you’re missing Bitterblossom from the Rogues list. I tested Blossom for a couple days and didn’t like it. That card works better with more disruption (especially discard). I think it’s a little slow for this kind of deck, although I do like its applications with Cloak. I’d like a follow-up on the Rogues deck. The list looks sweet. How does it perform in testing? Why not play the full set of Spellstutter Faeries? Or the playset of Snapcasters? The 1/1 from AER is cute and while I apretiate (and respect) its applications (killing Dark Confidant is no joke), my question is: how often does it connect with the opponent’s face to enable prowl? Is enabling prowl its only use? If so, what aren’t we playing peppersmoke in its place? -1/-1 breaks a Goyf vs Goyf stalemate. Traverse for him or comboing it with Faerie Impostor gives a creature -2/-2 which is very relevant. All that said, its still a 1/1 for one for which we devote four slots in the deck; is he worth it? I’d like to see a list including Delver of Secrets, Pestermite or Ninja of the Deep Hours (Oh god, I wish he was a Rogue). Did you already tested and dismissed those cards? I’ve tried 1-4 Sprites and like two copies the best right now. They can be clunky in multiples, and this deck likes to play its cards on its own turn for the most part (Serum, Fortune, Brutality, creatures, etc.). Holding up two mana is often not a great plan until we start getting to three and four mana and also gain access to Snapcaster plays. But I still like having more than one copy of SSS in the deck since it’s great with Traverse (and Imposter), and we do want to draw it naturally in many scenarios. Similar deal with Snapcaster: it’s a card we really need access to in the deck, but we don’t want to flood on them. I’ve also been happy with two of these. Prowler tends to enable prowl reliably against decks without creatures, and provide value against ones with. 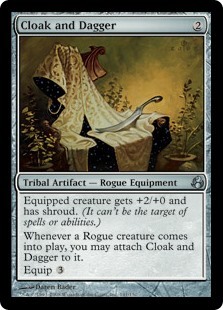 Running eight+ one-drop Rogues also lets us include Cloak and Dagger, which makes them each perform better on their own. I’ve found a one-mana creature with a sometimes-relevant upside to perform better than two-mana creatures with more reliable benefits, such as Looter-il-Kor and Obsessive Skinner. But for a long time we just didn’t have a one-mana Rogue available whose sometimes-relevant upside was relevant enough of the time to warrant its inclusion; our closest analog was Guul Draz Vampire (which I did try in some shells). Prowler is a huge upgrade. If Delver were a Rogue, we would snap-include it. I mean, we likely wouldn’t have to, as Thieves’ Fortune might just find its way into Delver decks and sate the hunger that drives me to brew with Rogues in the first place. But without that card type, it’s way too much work to include Delver here. Keep in mind we also only run 20 I/S in this version, and my previous versions have played even fewer. Great work, thank you! Concerning the Rogue deck: I read your article about the Ninja of the deep Hour deck a couple of weeks ago. Have you tested NotdH in this Rogue deck? Last questions: matchups. What are good and what are bad matchups in your tests? Thanks for your replay and please keep on writing about your brews!!! Haven’t tested Ninja. There’s another card that requires some pretty big workarounds, and I’m not comfortable testing it in a deck that’s already doing that for its own synergies. If Ninja were a Rogue, though, I definitely would be! UM just isn’t flexible enough. It’s “reach,” but we have to already be getting through for it to work, and it makes us even weaker to spot removal. High risk, low reward. As for Squad, it’s pretty easy to enable in this deck. I just don’t think there are a lot of decks that it’s great against. If Ad Nauseam or Valakut show up in droves and hassle this deck, I would try a Squad in the side. Just one is probably fine it costs 3 to prowl, giving us time to dig for it with Fortune and Serum.